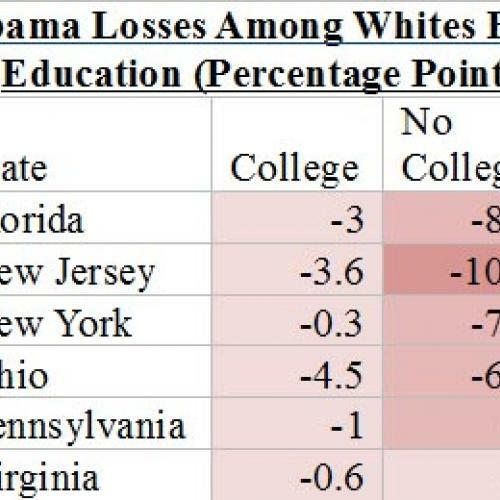 As I explained yesterday, Obama’s losses among less educated white voters are serious. But remember: those losses are likely to vary state by state. White voters without a college degree in Portland shouldn’t be counted on to swing like those in Pensacola. 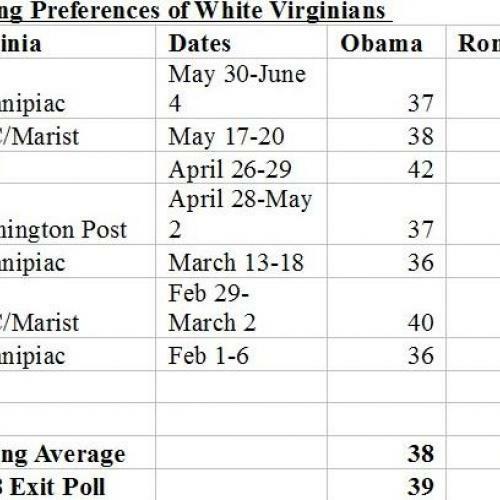 There isn’t enough state polling to yet confidently state which areas are most likely to tilt one way or another, but there is enough data to observe one emerging trend: Obama doesn’t appear to have lost any support among white non-college voters in Virginia, leaving Romney with a Virginia problem. Recent state polling confirms Quinnipiac findings. In Virginia polls since February, Obama is averaging 38 percent of the white vote, down just 1 percentage point from 2008. In contrast, Obama has lost an average of 5 percentage points among white voters in recent national polls. And given that most of Obama’s non-white supporters in Virginia are African-American, Romney probably can’t plan on compensating with gains among non-white voters. Diminished African-American turnout could allow Romney to compete with small gains among white Virginians, but even substantial declines in non-white turnout might not be enough if Obama wins 38 percent of white voters. So what explains Obama’s resilience in Virginia? It’s tempting to assume that Obama’s 2008 support among white non-college voters might constitute somewhat of a floor in a southern state. But Obama has taken substantial losses in Florida, another state with a large southern population. To be sure, that isn’t enough to dismiss the southern-floor explanation—after all, Florida is a diverse state with a large number of northern transplants—but there isn’t enough data yet to make that explanation convincing. Whatever the reason for Obama’s lasting support, if the Romney campaign views Virginia as essential to their prospects, then Romney’s electoral path starts looking tough. Obama’s unusually educated and diverse coalition in Virginia already suggested that Romney would struggle to make inroads. If Obama is also holding strong among the sliver of non-college whites who supported him in 2008, then Romney’s already difficult task gets even harder.